This is an assortment of bowls from a recent kiln firing. They are for sale. Click a small bowl to see a larger image and more information about purchasing these bowls. The Washington Street Gallery in Goshen IN - some work is always on display for sale in this gallery. The Richmond Art Museum Richmond IN - From Hoosier Hands invitational August 22 to October 10, 2004. Four Bartel works will be included. Work is for sale. Visits to my Studio and Display room are welcome. Arrange in advance by e-mail or phone. The $90 price of item #643 bowl includes free packing and ground shipping any place in the 48 states. 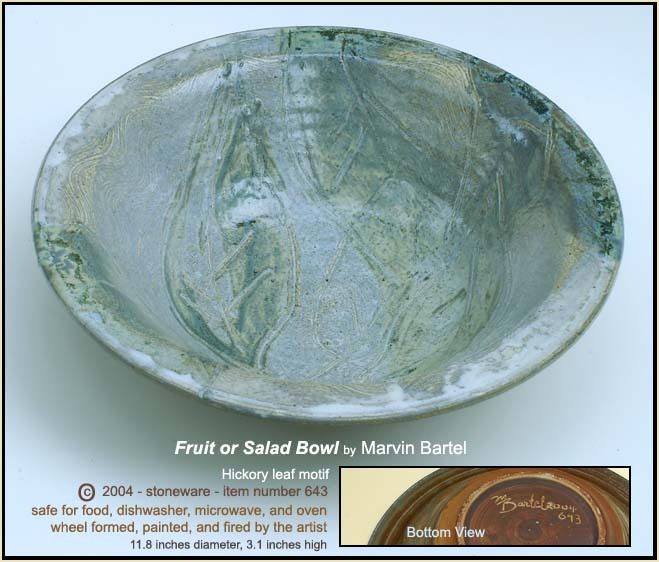 To Purchase a bowl, first contact Marvin Bartel, Goshen, Indiana. PLEASE NOTE: It will work to type the address into your e-mail program. If it comes back please proofread it carefully - it is a current address. It does not work to click it and it does not work to copy and paste it. Text-only exhibition catalog with prices and ordering information. © Marvin Bartel All rights reserved.